At a special session on health and the right to health services in closed institutions, held in Astana on 28 September 2017, PRI’s Central Asia (CA) office was invited by the Commission on Human Rights, under the President of the Republic of Kazakhstan, to deliver a co-report on behalf of civil society organisations on the issues of health in prisons and closed facilities. 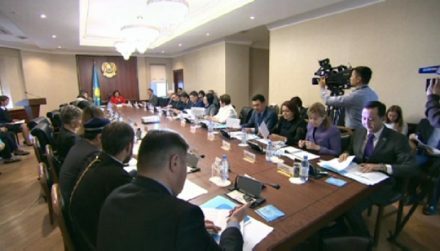 In his report, Azamat Shambilov, Regional Director of PRI’s CA office, called for the Kazakhstan government to transfer the prison health system from the Ministry of Interior to the mandate of the Ministry of Health, in order to provide adequate and accessible health systems for prisoners. The transfer of the penitentiary institutions’ medical service was first announced in 2006, but has experienced delays. The report also provided concrete examples of how the prison system and the Ministry of Health should implement the revised UN Standard Minimum Rules for the Treatment of Prisoners (the Nelson Mandela Rules), including the provision of mental health services and the use of tools to document and prevent ill-treatment and torture. Members of the Commission agreed with PRI’s recommendations, and urged the Ministry of Health to begin the transfer process. PRI’S CA Office agreed to assist with creating a working group in order to coordinate the transfer of prison medical services. Read PRI’s short guide to the Nelson Mandela Rules, available in eight languages, or watch a short animated introduction explaining the Rules.